West Palm Beach, FL - The South Florida Water Management District (SFWMD) Governing Board's innovative Python Elimination Program hit a major milestone today, with hunters killing their 500th Burmese python in less than five months. "The speed with which hunters are finding and eliminating these destructive snakes showcases not only their dedication to the effort, but also the enormity of this invasive predator problem in the Everglades," said SFWMD Governing Board Chairman Dan O'Keefe. "Every one of these 500 snakes killed helps ensure the lives of hundreds of native species essential to the Everglades ecosystem." 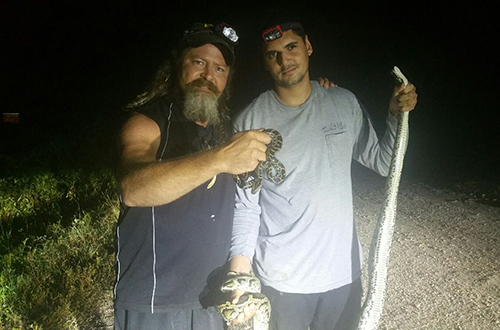 Python hunter Jason Leon, of Miami, killed the 500th snake, a 7-foot foot python caught around 5 a.m. today. Earlier this month Leon also caught one of the largest snakes, measuring in at 14 feet and 9 inches. Hunter Dustin "Wildman" Crum holds the record for the largest snake killed with a 16-foot-10-inch python. Hunter Michael Valcarce has the most pythons killed, with 52 snakes. In total, the snakes eliminated through this program would stretch more than 3,300 feet in length and weigh in at more than three tons.